Last month, WIT Agent Wailana traveled with our preferred vendor Vexplore Tours through Thailand and Laos. This month we are posting sections from her journal–read on for her insider tips! In case you missed Part Four on the Mekong Cruise, click here to read it. After the 3-night Mekong cruise, we disembarked at Luang Prabang for one final night in this charming town. Our hotel was the the Angsana Maison, a lovely, historic hotel just 20 minutes’ walk from the night market. 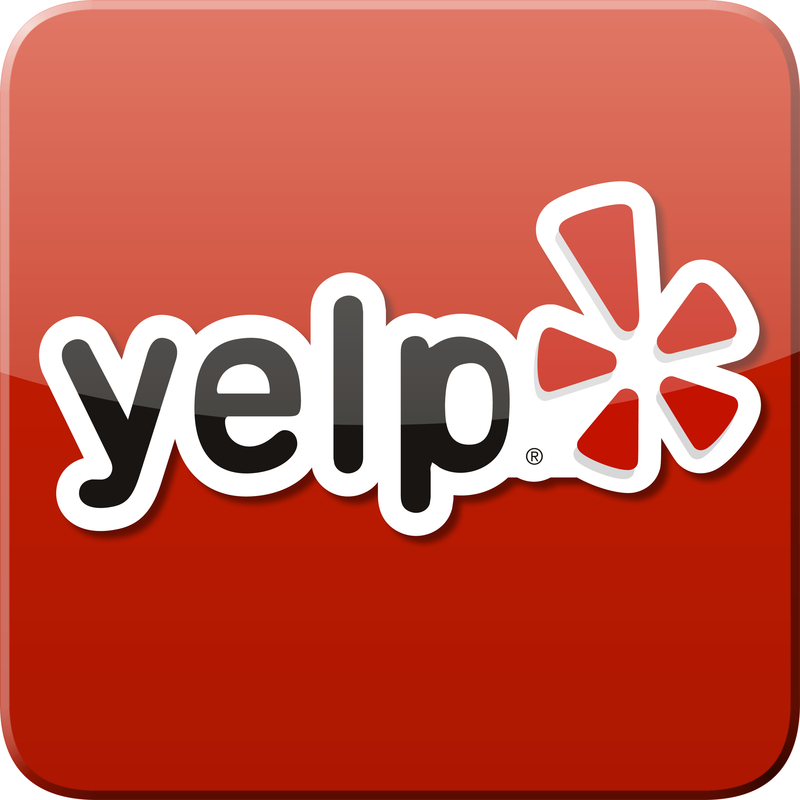 This property had a soothing atmosphere. Its white walls and intimate spa contributes to a simple boutique charm. 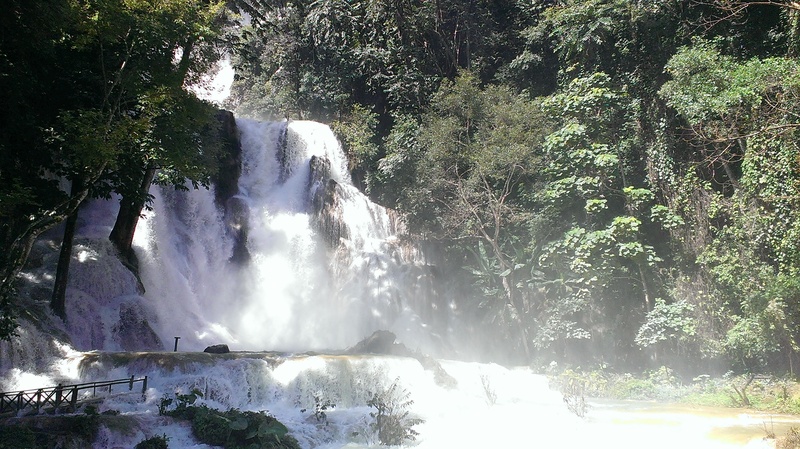 That day we drove in a passenger van out to the Kuang Si waterfalls, about 45 minutes to 1 hour from the city. As it had stormed violently the night before, the waterfalls had erupted into an impressive flood. During drier months (early Spring), people can usually swim or wade in the small pools at the base of the falls. 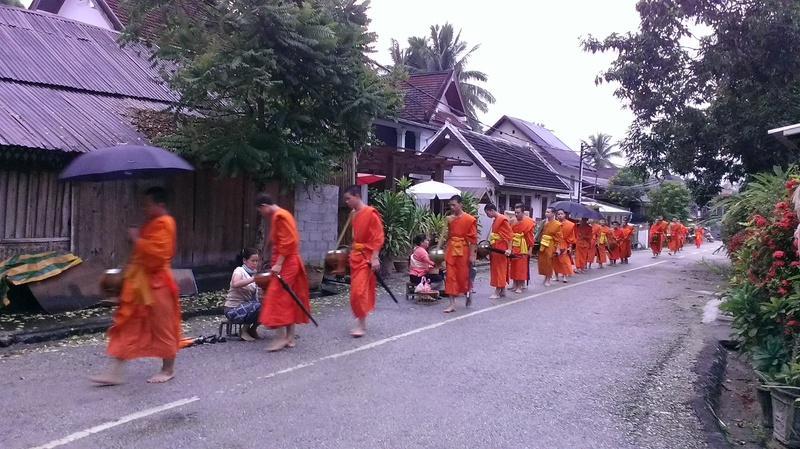 One of the highlights from the Lao trip I haven’t mentioned yet is the monk walk. Every morning, monks from the local temple line up and collect rice from villagers. They walk around a few blocks with their baskets, stopping for just a second for kneeling townsfolk to scoop out their morning rice. I bought a little sitting map and a large wooden tub of rice and waited for each monk—the older ones to the front, the younglings at the back. The line advances pretty speedily, so you have to move fast to scoop your rice into their tubs! 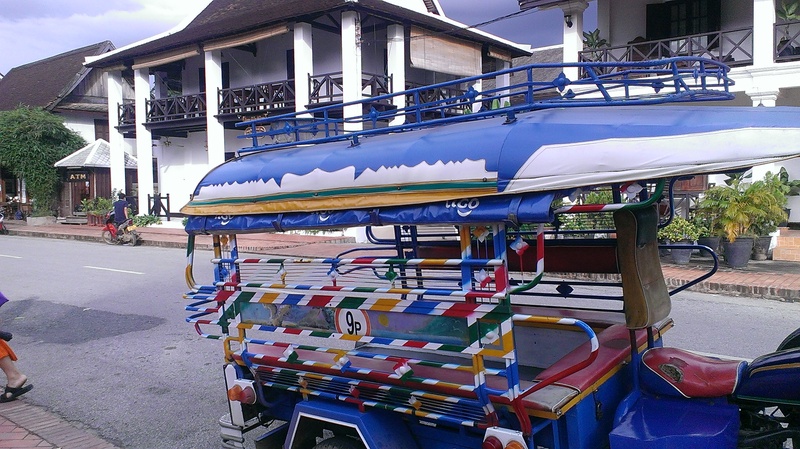 If you visit Luang Prabang, don’t forget to hop on a tuk tuk. These are different than Thai tuk tuk cars—in Lao they are quite colorful, blue trucks slathered in strips of bright yellow and red and green. 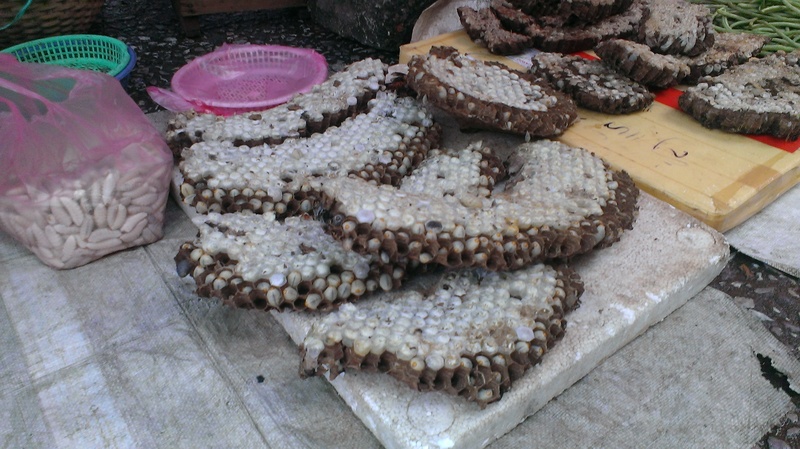 We drove out on one of these to the food market—a delicious collection of Lao goodies you won’t find anywhere else in the world: juicy bacon, marinated meat, lemongrass, buffalo jerky, strong coffee—even wasp eggs! That evening after a delicious dinner by the river (steamed fish in banana leaf! ), we drove out to a house in the residential district to attend a Baci ceremony. The Baci is a traditional ritual used to celebrate important events. Most Lao people are animists who believe in indigenous gods (phi) and thirty-two khwan, or spirits who inhabit the body. The Khwan bestow health and prosperity onto a person, and their absence directly correlates to illness or harm. The main purpose of the Baci is to call back your spirits, and it is often performed to welcome guests and travelers. A band of fifteen elders and a priest greeted us with a tower of bright orange flowers, strings, bananas and sweets. The ritual was brief but beautiful, and involved several dances from five 13- to 16-year-old girls in costume. 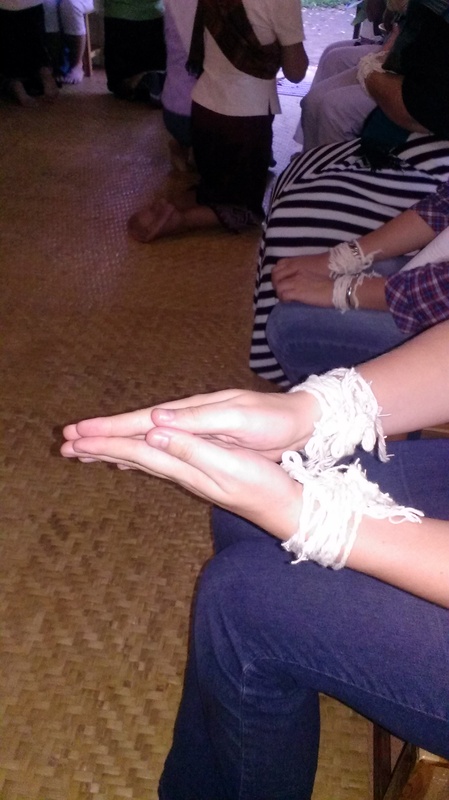 We each had our wrists bound in simple ropes, which we could keep on for 3 days for full spiritual potency. WIT Agents have all traveled extensively throughout SE Asia and regularly book clients around the region. Call 503-224-0180 to speak with one of our agents about a trip that’s right for you. Filed under Asia, Laos, Our Travel Agents, Vendors, Vexplore, Where in the World is the WIT Agent?